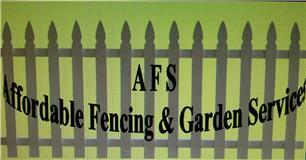 AFS Affordable Fencing & Garden Services - Fencing/Gates, Garden Services based in Datchet, Berkshire. Hello, and welcome to AFS Affordable Fencing and Gardening Services. We have many years of experience in fencing, landscaping and gardening. I pride myself in being meticulous and passionate about my work and the end results! Please feel free to contact me for a free no obligation quote! I look forward to helping you with all your fencing and gardening requirements.